The next winter concert from the Three Rivers Performing Arts Institute is quite simply too good to miss. 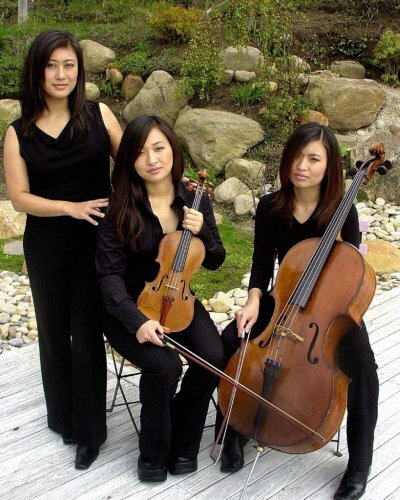 The Jung Trio will perform on Saturday February 26, at 7 pm, at the Three Rivers Presbyterian Church. The program is terrific, too—-Beethoven, Ravel, and Dvorak’s famous Fm Trio. There are very few trios performing on earth right now that possess the Jung Trio’s combination of technical brilliance, deeply felt emotion and nearly clairevoyant communication between piano, violin and cello. Perhaps because they are sisters each seems to sense what the others are going to do before they do it. They have performed all over North America, Europe and Asia. “… soul-stirring, captivating performances of supreme artistry. A spectacular group with wonderful musicality at their fingertips” is how one acclaimed critic described their music. Tickets are $12, now available at Chumps Video in Three Rivers, and also are available at the door. This entry was posted in Performing Arts Institute and tagged Jung Trio, Three Rivers Performing Arts Institute on February 21, 2011 by Elsah. 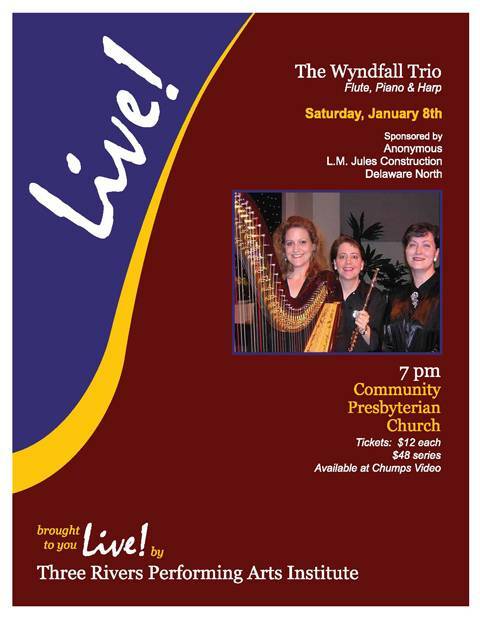 The Three Rivers Performing Arts Institute offers another wonderful concert in their Winter Concert Series on Saturday, January 8, at 7 pm at the Community Presbyterian Church in Three Rivers. Through their repertoire, arrangements and original compositions, the Wyndfall Trio offers a rich musical combination of flute, harp and piano. The Trio was founded in 1994 by the three Harris sisters, Wendy Harris-LeBlanc on harp, Tracy Harris on flute and Svetlana Harris on piano. “Stunning”, “Inspired”, and “Breathtaking” are words that are often used to describe their exciting performances. The Wyndfall Trio enjoys presenting a distinctive mix of repertoire from classical music to Traditional Irish tunes and is currently recording their first CD entitled “How the Wyndfalls”. The trio has performed over 100 concerts. Concert tickets are $12 per person, available at Chump’s Videos in Three Rivers and at the door. Everyone under the age of 18 is free. Profound gratitude is sent to this January concert co-sponsors by L.M. Jules Construction, Delaware North and an anonymous donor. The After Hours Bistro, from 8:30 to 11:30 pm, will feature appetizers, desserts, and specialty coffees and teas. The beneficiary of this month’s Bistro is our own Three Rivers School. $10 donation at the door, but of course, you can donate more to the school itself. This entry was posted in Performing Arts Institute and tagged Three Rivers Performing Arts Institute, Wyndfall Trio on January 4, 2011 by Elsah. 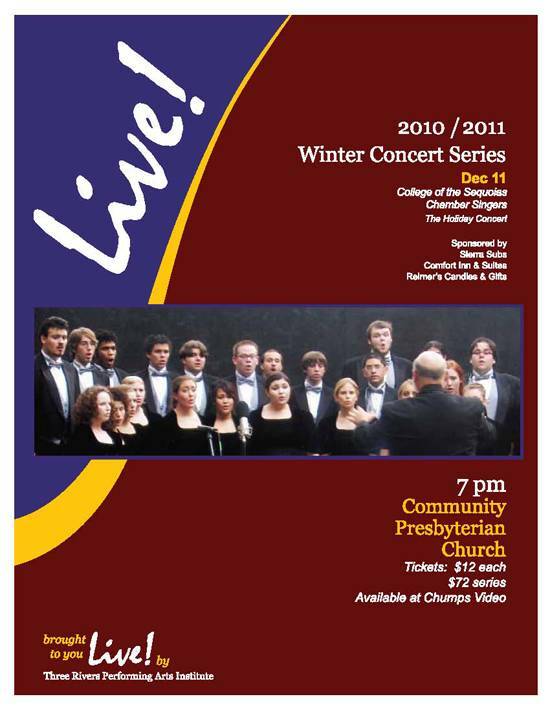 December 11: the COS Chamber Singers, presented by the Three Rivers Performing Arts Institute. The COS Chamber Singers are widely known for their outstanding musicianship and their exceptional sensitivity to the meaning of the music they sing. Year after year, acclaimed Choral Director Jeff Seaward magically produces one of the most consistently excellent student vocal ensembles in California. He has been teaching for 32 years. During that time his choral groups have performed all over the state, and have been invited to three national level festivals for the American Choral Directors Association. After the concert, please join us with the artists in the Harrison Hall dining room for a public reception. Everyone under the age of 18 is free. For the rest of us, tickets are $12, at Chump’s Video in Three Rivers. This entry was posted in music, Performing Arts Institute and tagged COS Chamber Singers, Three Rivers Performing Arts Institute on November 27, 2010 by Elsah.